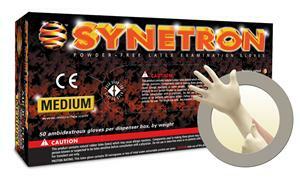 Synetron High-Risk Powder-Free Latex Gloves | Product Code# SY-911 Provides protection and tactile sensitivity for high-risk situations. The glove has polymer coating technology for greater film consistency and easier donning and an extended, beaded cuff for greater protection over the wrist and arm. Reduces the exposure to the degradding effects of chlorination. The glove is extensively leached for reduced total water-extractable protein levels. Thickness data: Cuff, 7.3 mils;palm, 9.8 mils;finger, 11.9 mils. Features and Benefits: Interior/exterior polymer system provides superior anti-sticking properties resulting in highly effective donning in wet, damp or dry conditions. Exceptional durability to handle tough tasks. Extended cuff for increased protection over the wrist and forearm. Fine fingertip sensitivity for finding a pulse and starting an I.V. POWDER-FREE LATEX EXTENDED CUFF EXAMINATION GLOVES: Textured for a secure grip. Synetron® is polymer-coated for easy donning. This glove meets the single-use emergency medical examination glove requirements of NFPA 1999, Standard on Protective Clothing for Emergency Medical Operations, 2008 edition. * and all current 2011 standards.